"Grab your sunscreen and ride the waves with our latest project with Evil Twin! We took the base recipe of our first collaboration, Trillikini, and ramped it up with a higher gravity malt bill and a massive dry hop of Citra/Amarillo/Mosaic! Board Shorts IPA is loaded with hop-driven flavors of grapefruit pith and bright stonefruit. The soft mouthfeel is complimented by fluffy oats and a dry, rustic graininess. Clean and crisp with firm, balanced bitterness. No lifeguards on duty!" Pours the typical hazy, light orange with a finger of pure white head. Pure peach juice on the aroma with some bready notes and touches of bitterness. I picked up no grapefruit on the nose, but it is here in abundance on the taste. Luckily, it is all flavor without acidity, so it has that going for it. I gotta say this is like a fruit salad with a healthy mix of pineapple, watermelon, and even some strawberry. Stepping away from the produce section we find that elusive bitter bite on the very back with each finishing sip. Letting it linger in the mouth for a few moments, this produces some lemon and a large amount of grassy bitterness. The bready notes from the aroma are here. They aren't as influential on the taste as, let's say, a blonde ale, but they are noticeable enough to leave an impression. Mouthfeel is standard with a nice creamy feel. I think "soft" is the best word to use here to describe the body. 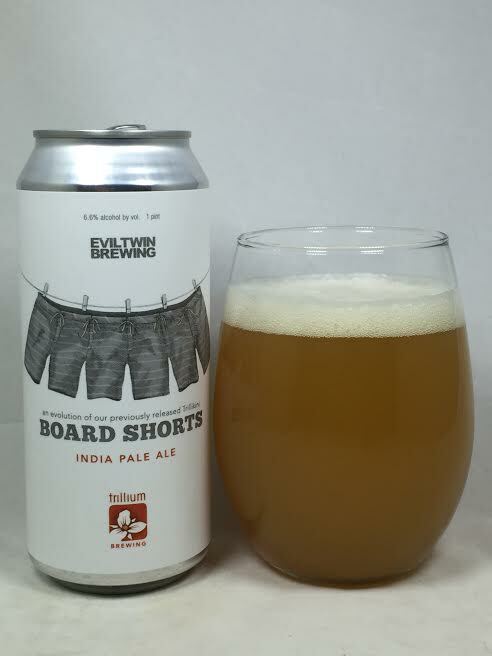 Board Shorts is another good IPA you've come to expect from Trillium. I think it is another solid addition to their lineup with a lot of juice and bitterness to satisfy both camps.